Purchasing a home is a complex and expensive process, particularly in rapidly growing cities such as Denver, Colorado, where the increase in residents has limited the number of available properties and made property prices go up. 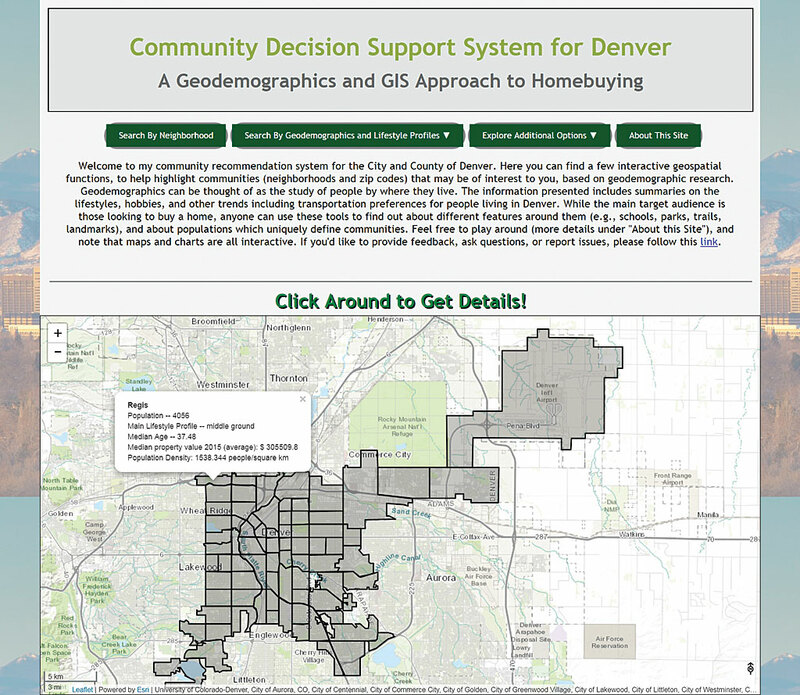 Community Decision Support System for Denver website home page. Searching for residential homes online is very popular in the United States, but traditional home buying recommendation engines like Zillow tend to be narrowly focused on property-based amenities and financials and often fail to include community perspectives that are critical to making better-informed decisions. There has been significant interest by local real estate and research groups in data-driven solutions that can more dynamically describe changes in population, socioeconomic characteristics, transportation trends, lifestyle, and general urban living conditions in Denver. A system that provides enhanced geospatial tools or friendly summaries via visual analytics would empower buyers. The author, a master’s student in geographic information science at the University of Denver, set out to develop a spatial decision support system for Denver that would help address these challenges by providing a variety of urban perspectives while maintaining a business-oriented approach. The system would be freely accessible via the web. Previously implemented real estate models and GIS lacked local context applicability because they had been developed for use in other cities or countries; were missing key attributes about populations and lifestyle; lacked geospatial functionality; or were expensive to develop and maintain. The inherent spatial and temporal nature of the population and geography data led her to propose a GIS solution that could portray information spatially and in attribute format (via charts or other infographics). The specific goal for the web prototype system was to assist local home buyers in gaining social, demographic, economic, and geographic perspectives on communities in the area. The author’s knowledge of geospatial tools and applicable datasets immediately led her to Esri products. On the questionnaire recommendation page, users input details about their lifestyle and are provided with recommendations based on communities that match those lifestyle trends. She was able to fulfill some of the application’s data needs by leveraging Esri Tapestry Segmentation profiles to contextualize the city’s geodemographics (i.e., the study of people based on where and how they live). The Tapestry data supplies community-focused information. It provided data on households, families, and housing preferences as well as employment, education, transportation, commuting preferences, shopping, entertainment, hobbies, and financial trends. These characteristics are frequently mentioned in literature and studied by real estate and business marketing professionals. Understanding people, their lifestyle, and how they interact with their communities and environments is essential for making smarter decisions and providing strategic services. Modifying the Esri Leaflet Spatial Containment function so the user can compare similar amenities for other communities based on Tapestry profiles. Since the goal was delivering a new kind of community recommendation tool that would complement existing ones from Zillow or Trulia, the next step was determining the specific functionality that would be built into the system. After studying the Tapestry datasets and the functionality provided by the Esri Leaflet API, the best approach was to focus on helping prospective home buyers understand lifestyles in various communities that matched their own. Unlike traditional real estate portals, this system would incorporate community recommendations to match home buyers with potentially suitable neighborhoods based on the answers those home buyers provided to questions about lifestyle and preferences related to shopping, entertainment, and commuting. This introduced a level of complexity in recommendation provision that was possible thanks to attribute-rich Tapestry, consumer expenditure reports, and demographic datasets by Esri, which outline categories by which to summarize communities and their populations. All these application functions would additionally include interactivity and supply fairly rich attributes that could be explored both visually and analytically (with charts, graphs, tables, and maps). The crime visualization function helps users understand, by crime category, the areas with the most and least crime. 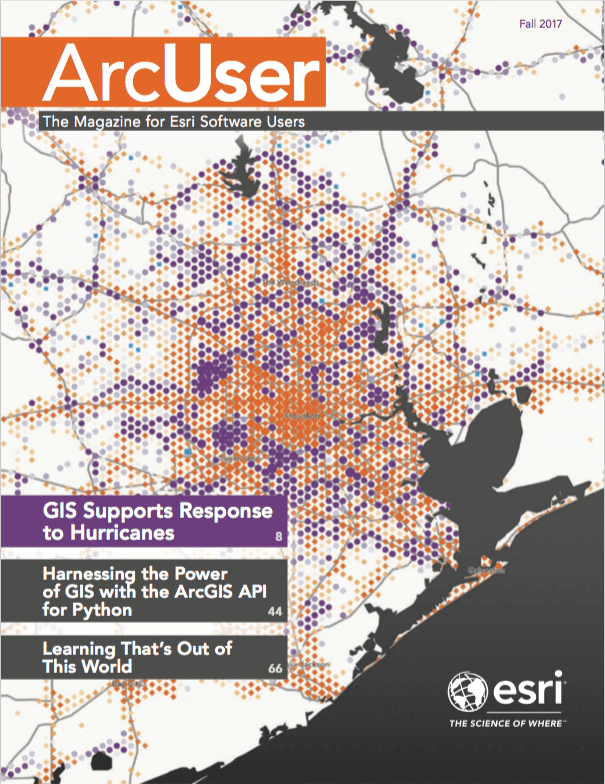 Esri Leaflet API was used to leverage mapping and related GIS functionality on the website. The GIS analysis customization capabilities are almost endless with this API and enable users to maximize data exploration and knowledge acquisition about their communities. Furthermore, hosting GeoJSON layers (a lightweight format for encoding geographic data structures within websites) in ArcGIS Online was quick and easy. Search by neighborhood to obtain visual and statistical information on that neighborhood. Search by Tapestry group based on a user’s answers on a simple questionnaire that are used to rank neighborhoods within the same or similar lifestyles. 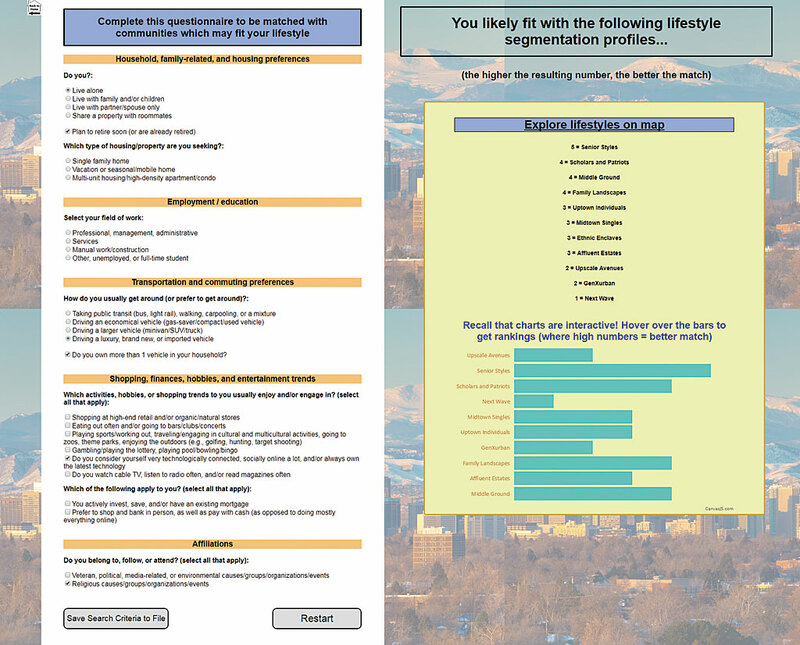 Lifestyle mapping allows a user to review all the unique criteria of a lifestyle profile and visualize the results on an interactive map. Select features on the map within a specified proximity of a point of interest or address using a tool. Perform spatial queries to find all features contained within a ZIP code (containment area), and analyze the results shown by single and multiple ZIP code charts that can be used for comparison purposes. 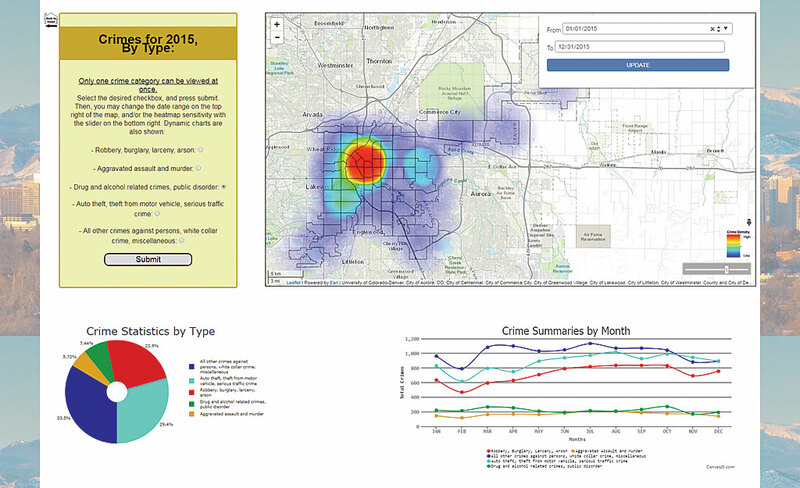 Manipulate heat maps to show patterns of different categories of crime over time. Calculate travel times and distances (by car) based on inputted addresses and live traffic data. A traffic visualization with historic trends is also available. 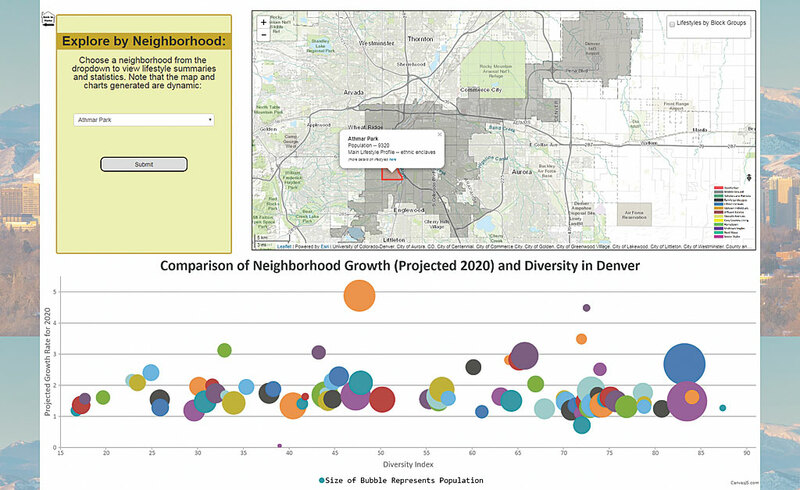 This function queries for a selected neighborhood, then displays a chart summarizing diversity, projected neighborhood growth, and total population per neighborhood in Denver. The developed system is merely a prototype and is not intended to replace or compete with popular real estate information providers. Website users were asked to complete a quick, anonymous user evaluation survey that furnished feedback, suggested updates, and tested site performance. The nine-question survey asked about general-use aspects and included rating the system’s effectiveness in delivering GIS functionality and performance. Users could also provide written comments and discuss ideas for future implementations. As of June 2017, every user reported average to high scores for all questions. Furthermore, more than 60 percent of users claimed they would recommend this website to others looking to learn about communities in Denver. Those responding to the survey included potential home buyers, real estate professionals, business experts, and researchers. From survey ratings and comments, it was concluded that the system delivered results accurate enough to be competitive if it were further developed and improved. In addition, the implemented methods and datasets were corroborated against other data sources, statistics, and systems and were deemed appropriate in terms of performance and delivery by a team at the University of Denver. Although still in the early stages of testing, the popularity of the prototype is expected to continue growing. More real estate professionals recognize the growing power of this type of geospatial functionality and its usefulness when combined with holistic community- and lifestyle-based information. It can truly empower users in the business, marketing, and real estate industries. In the near future, the author anticipates maintaining the system and datasets in a cloud environment and pushing updates based on user requests, advisory team recommendations, or as needed to maintain technological and quality assurance standards. 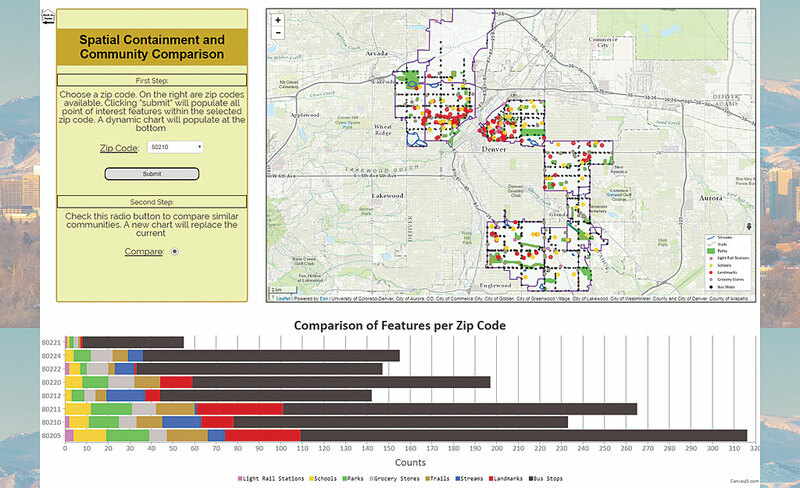 This project has been able to successfully leverage—even in a minor way due to its prototype nature—Esri Tapestry data and Esri Leaflet API functionality to deliver a GIS-based home buyer recommendation system for Denver, Colorado. Based on the feedback collected, it is clear that users find this type of system practical and benefit from geospatial tools and lifestyle-rich information currently unavailable at other sites. The author intends to improve the system in the future but has learned that cooperative efforts would be more effective in delivering high-end products. She hopes to partner with local collaborators to enhance the system, test it within a larger market, and advertise it as a free tool. Thanks to Esri Tapestry data and the Esri Leaflet API, publishing a new kind of community recommendation system with comprehensive socioeconomic, demographic, and geographic details has been possible. The prototype may easily be implemented at larger scales, coupled with traditional property-focused real estate systems to assist realty companies. The tools can be refined to work for other locations, too, including rural areas. It is hoped that—for the sake of empowering home buyers and communities—the use of Tapestry data and geospatial functionality within real estate decision support frameworks will become the norm. For more information, visit the Community Decision Support System for Denver website or contact Marta Blanco Castano at marta.blanco-castano@alumni.du.edu. Marta Blanco Castano is a recent graduate of the University of Denver, where she received a master’s in geographic information science. She currently works as a research assistant for the institution, helping develop geospatial solutions to support decision-making in various contexts. She is passionate about applying spatial analysis and data visualization methods to Web GIS, business geography, earth sciences, and urban planning and development to understand complex dynamics between societies and the natural and built environment. She has been involved in several geospatial technology design projects, including the US Geological Survey 3D Elevation Program and the Open Geospatial Consortium Testbed 13.